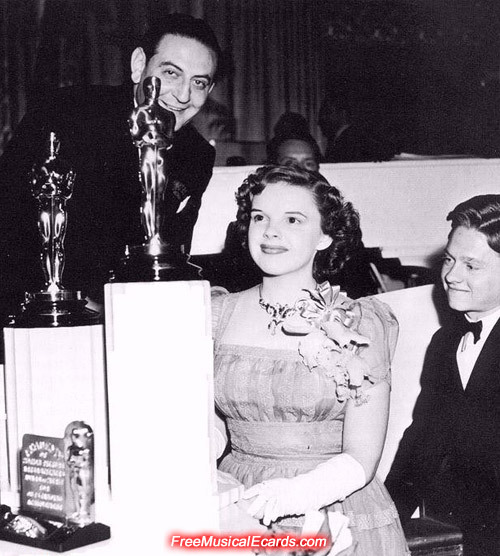 The adorable and youthful Judy Garland receives a special juvenile Oscar award for Best Performance by a Juvenile Actor, with Guy Lombardo (bandleader and violinist) and Mickey Rooney (close friend and fellow film star). 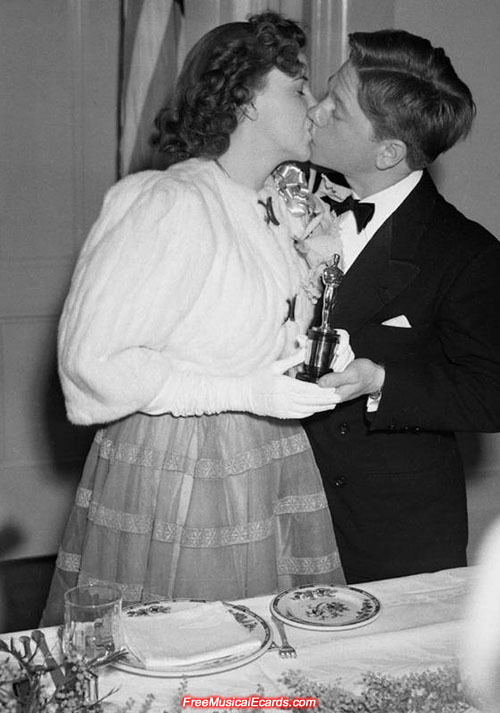 The 12th Academy Awards, honoring the best in film for 1939, was held on February 29, 1940, at a banquet in the Coconut Grove at The Ambassador Hotel in Los Angeles. 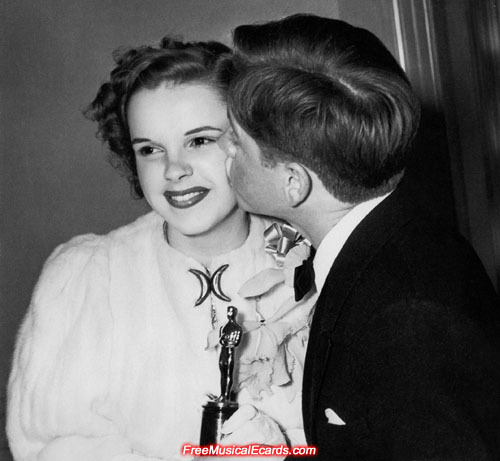 Judy Garland and Norma Shearer enjoying themselves at the Academy Awards ceremony, way back in 1940. 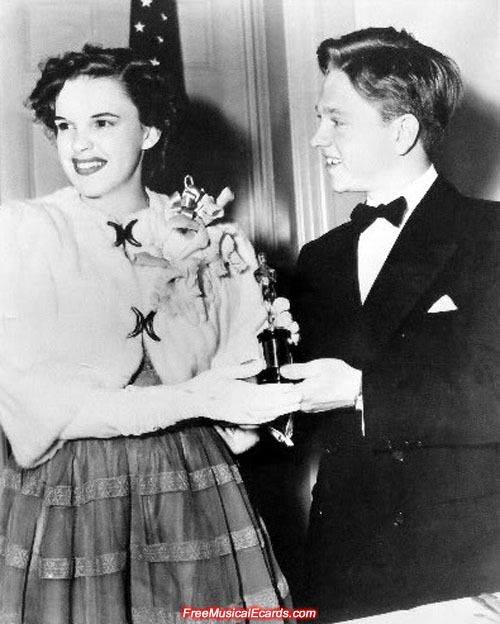 Teen Judy Garland in a beautiful dress, goes to accept her Oscar. 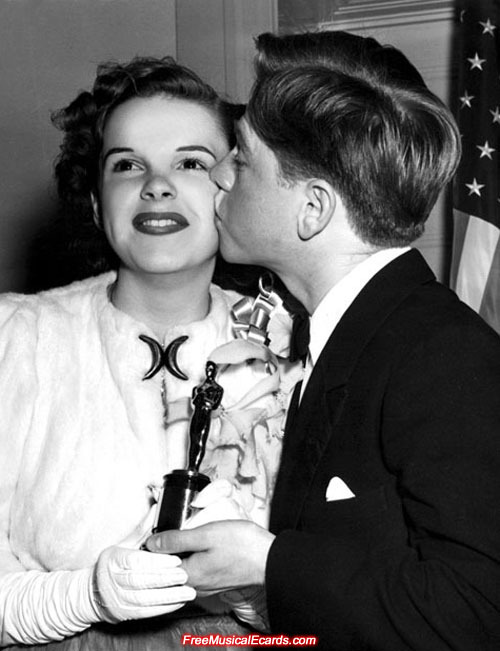 Presenter Mickey Rooney hands Judy Garland her Oscar, gives her a kiss on the cheek, then asks her if she could sing her signature song, "Over The Rainbow". 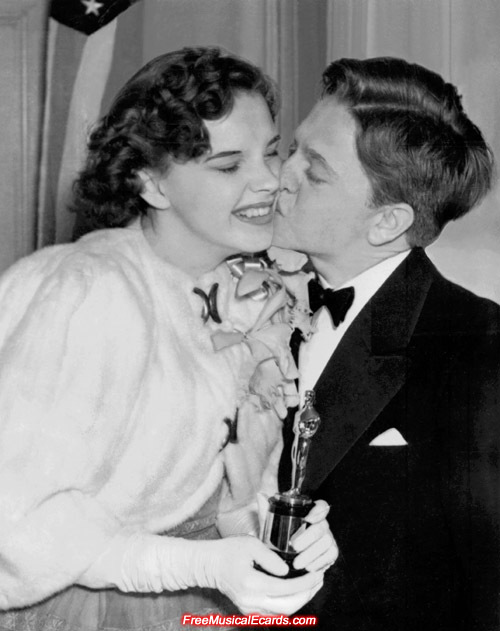 Young stars, Mickey Rooney and Judy Garland share a kiss at the 12th Academy Awards in Los Angeles. 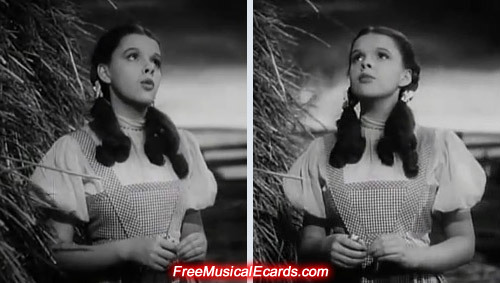 The talented Judy Garland playing the lead role of Dorothy in The Wizard of Oz (1939). 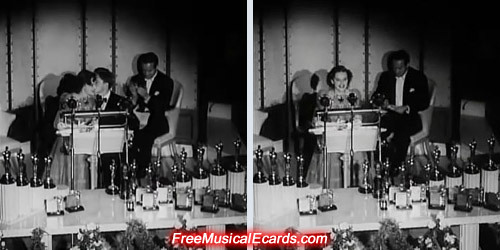 The Wizard of Oz won two Oscars, for "Best Original Score", and not surprisingly for "Best Song" (Over The Rainbow). Mickey is a lucky dude at this Oscar event. 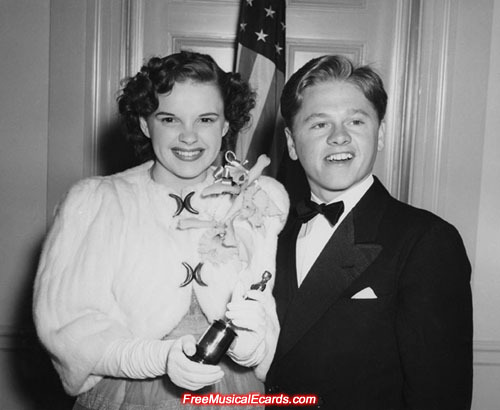 Mickey Rooney was lucky even outside this event. 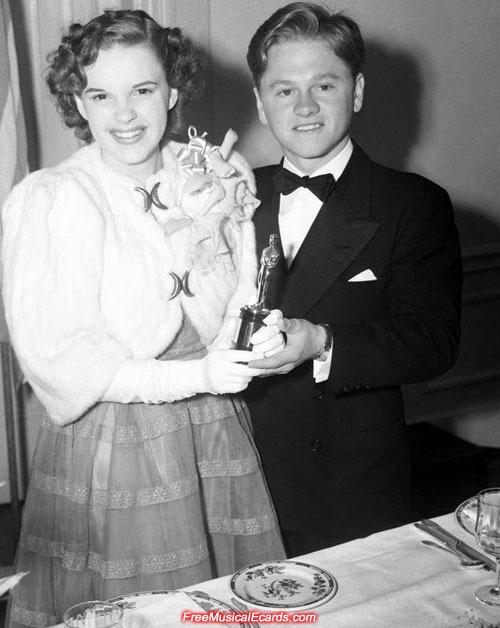 He was a great child actor himself, having also won this award a year earlier in 1939. 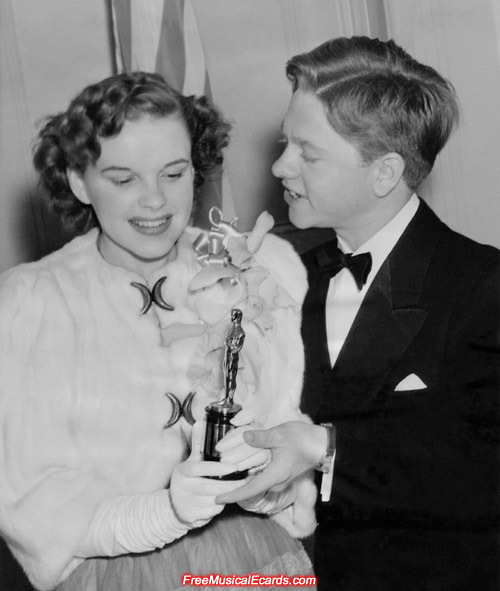 American bombshell singer-actress Judy Garland holds her Oscar with Mickey Rooney at the 12th Academy Awards. 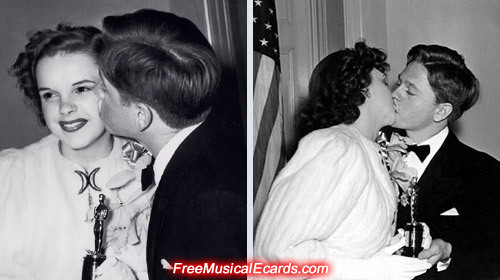 Miss Garland would go on to star in 32 full length Hollywood movies in her career before taking centre stage as a singer.